Backstage at the Capitol Theatre (Broadway at 50th Street), sometime between 1928 and 1930. From left, Bernard Nadelle [? ], Leo Zeitlin and Alexander Savitsky. It’s a muggy Friday afternoon in July 1990, and my husband and I are the only visitors to Block 15 of Old Montefiore Cemetery in Queens. As storm clouds roll across the sky and planes noisily approach JFK, we watch two grounds­keepers trim the dense arbor vitae that envelops Local 802 member Leo Zeitlin’s tombstone. I am convinced that Zeitlin composed “Eli Zion” for cello and piano, arguably his most important work, but I haven’t been able to prove it, and three other musicologists have attributed the work to another man with the same first and last name, and the same middle initial. The groundskeepers finish trimming, and the stone becomes visible. My eyes leap to the top line, and my conviction is confirmed: engraved on the stone are the first two measures of the cello part to the piece! Why was I so eager to track Zeitlin down? I had found a copy of “Eli Zion” in an archive in Tel Aviv when I was looking for works for cello and piano on Jewish themes, and I had performed it several times. It was embarrassing to know nothing about the composer, so I turned to secondary sources, all of which seemed to attribute the work – incorrectly – to the Soviet violinist Lev Moiseevich Tseitlin. The tombstone settled that argument, although at least one musicologist never believed me! I now know a lot more about Zeitlin. Born in Pinsk (now Belarus) in 1884, he attended music school in Odessa and conservatory in St. Petersburg, where he studied with Rimsky-Korsakov and Alexander Glazunov and joined the Society for Jewish Folk [Ethnic] Music. Prior to coming to the United States in 1923, he had had an extensive career, performing on both viola and violin, composing and conducting, and teaching in Russia, Ukraine and Lithuania. Before discovering his tombstone, I had seen an obituary for Zeitlin in the New York Times, and I had determined (from New York birth records) possible names for the two children it mentioned: probably Nathan, and definitely Ruth. After the tombstone, I got even luckier. Chicago genealogist Sanford Masovitz sent me a handwritten list of 328 people named Zeitlin in the United States, which included three Nathans. My third telephone call located Leo’s son and, the same day, his daughter Ruth. She had inherited from her mother and preserved a trunk that held almost all Zeitlin’s known manuscript scores, and other memorabilia. Shortly after joining Local 802, Zeitlin joined the orchestra at the Capitol Theatre (Broadway at 50th St.), one of New York’s huge “picture palaces” where music – both classical and popular – was a major element of the show. The Capitol seated more than 5,000, and its orchestra was considered the equivalent of a major symphony. At its largest, the ensemble numbered almost 100 and was known for “high-class musical selections,” routinely playing works of Wagner, Liszt, Tchaikowsky and Beethoven. In 1925, the Capitol apparently realized that Zeitlin was not only an instrumentalist but a composer and arranger, and he began to receive arranging assignments. Initially, these were of light classical and popular works, which were played on the theatre’s Sunday evening radio program, “Major Bowes Capitol Theatre Family” on the predecessor station to NBC. Zeitlin’s first arrangement was “When Love Sings a Song in Your Heart,” performed in 1925 by the nine-man Capitol Baby Grand Orchestra. In 1929, his assignments began to be more substantial: two overtures incorporating arrangements of popular songs were followed by at least five other overtures, including “Palestina (Rhapsody on Hebrew Themes)” in honor of the Jewish holidays, which introduced every show during the week of Sept. 20, 1929. Old Local 802 directories tell us where Zeitlin was living and when. Clearly, earning more money made it possible for the Zeitlins to move from the Bronx to Manhattan, and then from one apartment to another. Eventually, in October 1929, now the parents of Nathan and Ruth, they purchased a one-family house in Queens. But Leo lived only another nine months before dying suddenly in July 1930. And finally, what about the picture above? As early as April 1928, Zeitlin also began to play in the Capitol String Quartet with David Mendoza (then conductor at the Capitol), Alexander Savitsky, and Bernard Nadelle. 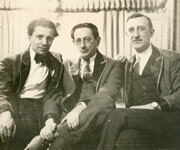 Zeitlin is in the middle of this photograph (labeled “Capitol Rest Room”), and Savitsky is on the right. I’ll leave readers with this final mystery: can anyone tell me whether the man on the left is Bernard Nadelle? Paula Eisenstein Baker is a member of AFM Local 65-699 (Houston). She teaches at the University of St. Thomas (Houston) and co-edited “Leo Zeitlin, Chamber Music” (A-R Editions, Inc., 2008) and “Leo Zeitlin, Palestina” ((A-R Editions, Inc., forthcoming). E-mail her at eisenbak@stthom.edu.